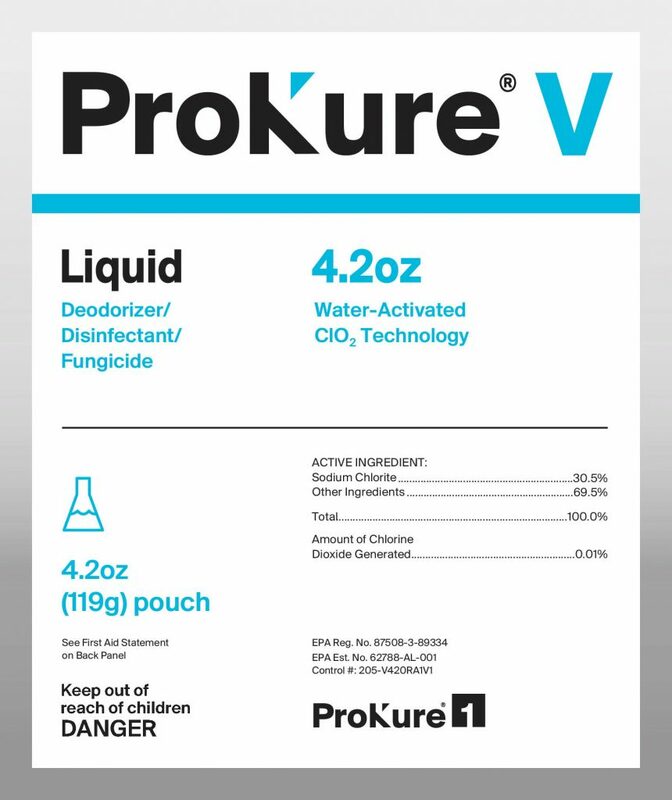 ProKure V is an EPA-registered, liquid deodorizer/disinfectant/fungicide formulated for hospital use that ships dry in formula packets. Inside the formula packets are white pouches that are water activated to create ClO2 liquid, that can be sprayed, wiped or mopped on all hard, non-porous surfaces. The liquid spray leaves no harmful residue and is suitable for water and smoke damage restoration, including sewer backup and river flooding, and trauma scene decontamination. It is a violation of Federal Law to use this product in a manner inconsistent with the labeling. (DO NOT OPEN THE WHITE POUCH). 2. Place the white pouch in an opaque (not clear) container filled with water. 3. Allow pouch to activate in water for one hour to reach maximum strength. Suitable for water and smoke damage restoration, including sewer backup and river flooding. Kills bacteria, viruses*, mold and odor-causing bacteria. Easy to use, apply to surface and allow to air dry. 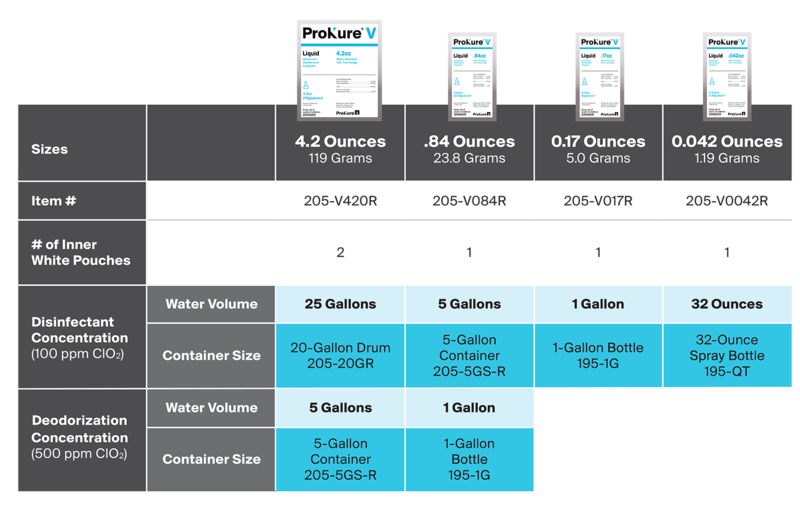 Application rates will vary; contact ProKure1 regarding dilutions and contact times or other specific applications like coverage ratios. Keep unused formula in a closed or sealed container in a cool, dark location that is not subject to any sunlight. Record activation date onto the container. Use stored formula within 15 days of activation. Agitate and allow one hour before use to ensure solution reaches full strength. Click here to learn more about supporting containers, applicators and other accessories you will need to get the job done. It’s common for some old buildings to have a musty smell. That’s not always a big problem. But visible mold is a problem...a health concern that requires expert attention. Imagine a broken sewage pipe inside a prison. It spews spreading filth that covers everything nearby, gushing into low areas and filling every nook and cranny. The only thing more disgusting than the muck that is visible to the eye is the thought of the unseen nastiness and disease within the foul deluge. Find our Products on JonDon.com.